I have some very exciting news: I recently decided to invest in a Crock Pot!! OK wait, that’s not true; my dad recently invested in a Crock Pot for me, via an Amazon gift card — Thanks, Dad! But, let me tell you, I can’t get enough of this thing! It’s all round and silver and shiny… what a stud. In all seriousness, this is the perfect tool for cooking through a crazy lifestyle. I can spend maybe 10-20 minutes in the morning putting the ingredients together in the pot, turn it on before I leave, and voila! An entirely cooked meal ready to go when I get home. I’ll admit, the first time I used it I was a tad weary of leaving a cooking device plugged in and running for the whole day while I was out…I anxiously carried my phone with me all day, half expecting to get a livid phone call telling me I’d successfully burned down my entire apartment building. However, when I returned I was pleased to find little Mr. Crock Pot cookin’ away like a champ and absolutely no sign of any mischief. It was also super easy to clean up after; you simply remove the ceramic bowl and wash it by hand or in the dishwasher. Amazingly, I even found these little crock pot liners (Reynolds brand) that you can use on extra lazy nights, which eliminate any and all cleaning afterwards. How much easier could it get?! For the first test run using my new toy, I admit I was pretty ambitious; short ribs are not exactly in keeping with the “super easy” theme of the slow cooker. But the few minutes of extra effort when assembling the recipe were well worth it. These bad boys were an instant hit! 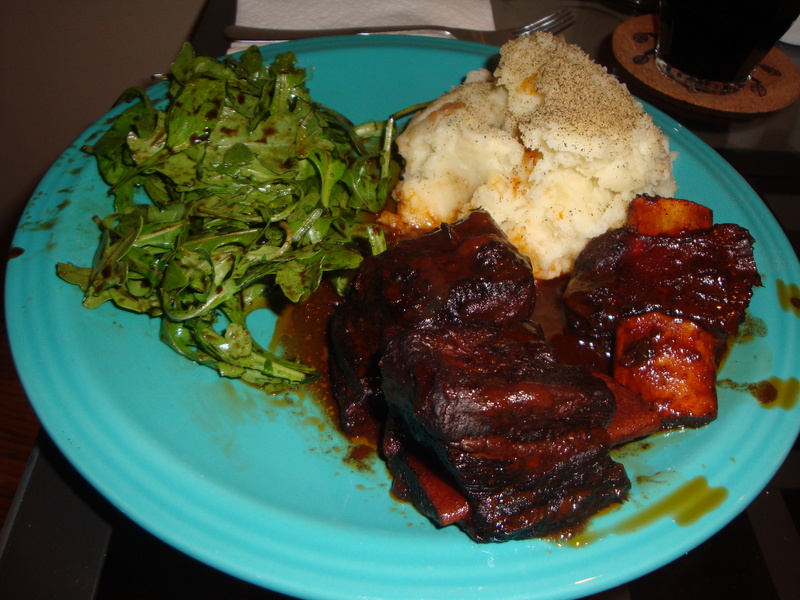 The meat was unbelievably moist and flavorful; served alongside some mashed potatoes with a bit of garlic and parmesan cheese blended in and a simple salad, this was a wonderful winter meal for a night in. Heat the oil in a skillet over high heat. When hot, add the short ribs. Sprinkle salt and pepper over the ribs in the pan and brown. This will take about three to four minutes per side. You want them very nice and caramelized. 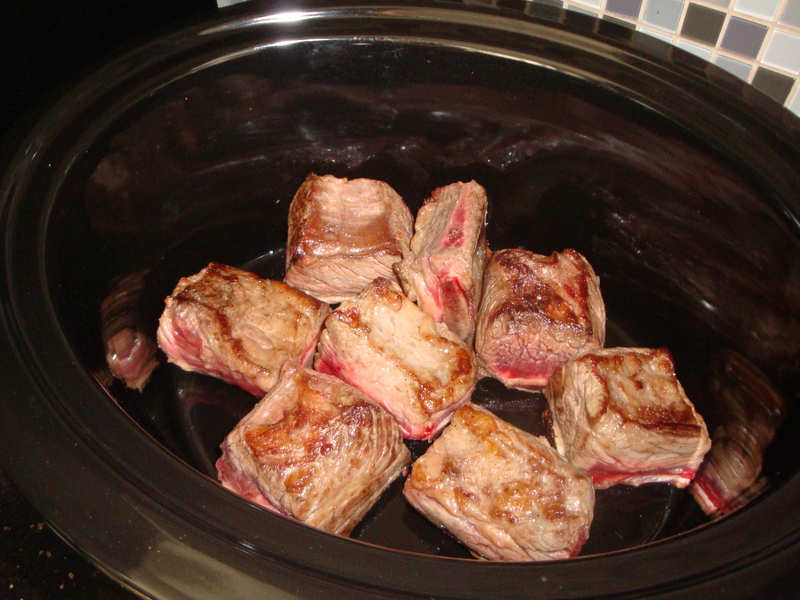 After the ribs have browned, remove from carefully and set them at the bottom of your slow cooker. Take the pan off the heat briefly to cool down, then return to medium heat and add the minced shallots and diced celery. Saute for about five minutes until tender, then add the tomato paste. 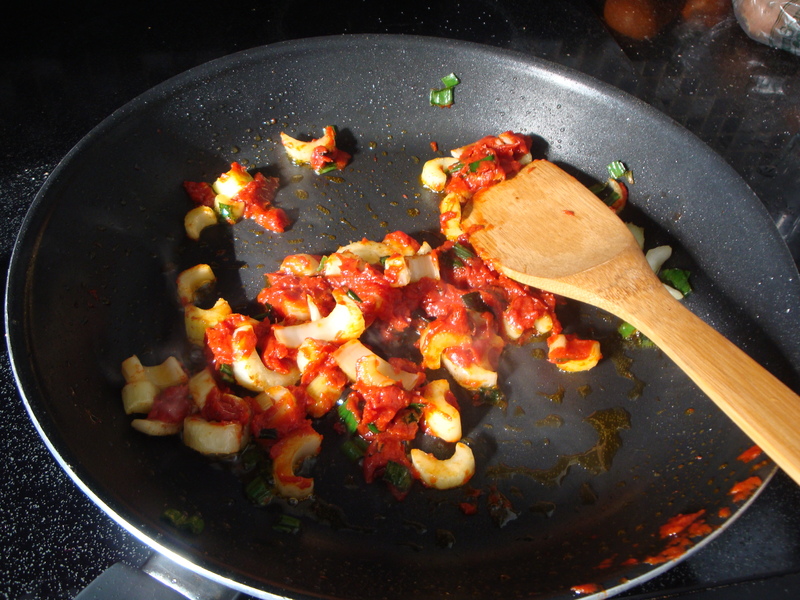 Mash the tomato paste into the veggies using a rubber spatula and continue to sauté on medium heat for another four minutes. Pour the wine and the beef broth into the skillet and stir. Add the brown sugar, a teaspoon of salt, half a teaspoon of pepper and the flour. Stir well to get rid of any flour clumps. Bring sauce to a boil, then to a simmer. Pour sauce right over ribs in the slow cooker. Sprinkle remaining salt and pepper on top. 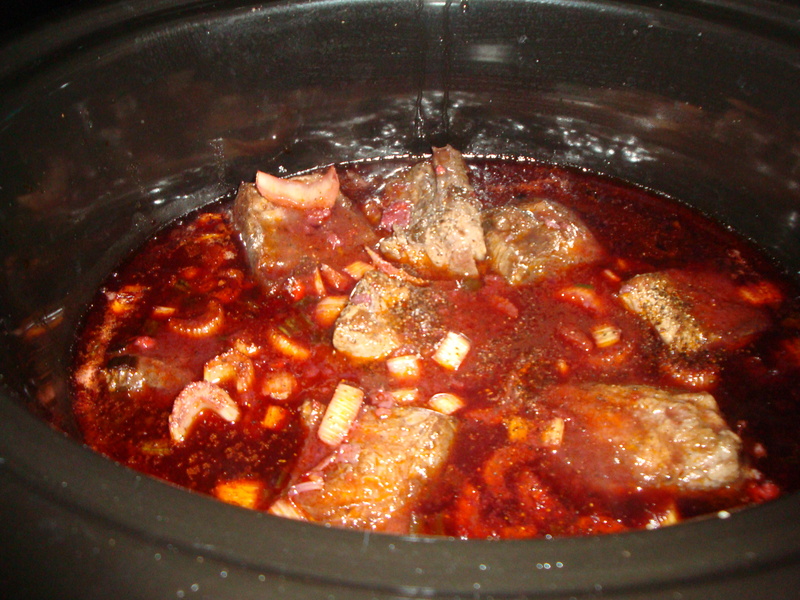 Place lid on slow cooker and cook on HIGH for seven to eight hours or on LOW for 11-12 hours. When done, the meat should literally be falling off the bone. Posted on December 1, 2013 by Jilly G	• This entry was posted in Kitchen Tools/Gadgets, Recipes and tagged kitchen tools, meal, potatoes, savory, short ribs, slow cooker. Bookmark the permalink.